ALung Technologies has secured $36m of funding to advance the development of its Hemolung respiratory assist system (RAS). The firm secured series C financing under the round led by Philips and UPMC through commercialization arm UPMC Enterprises. The funding will be used for a planned US-based pivotal trial of Hemolung respiratory assist system (RAS), which is a minimally invasive artificial lung device that removes carbon dioxide independently from the lungs through respiratory dialysis. In 2015, the company secured expedited access pathway (EAP) status from the US Food and Drug Administration (FDA) for Hemolung RAS. The company has designed Hemolung RAS as a dialysis-like alternative or supplement to mechanical ventilation. Philips patient care and monitoring systems Dr Adam Seiver will join ALung’s board as a representative from Philips, while UPMC Enterprises executive vice president Jeanne Cunicelli will join as a representative from UPMC. ALung chairman and CEO Peter DeComo said: “With this new financing, we will be able to conduct our US-based clinical trial, an important step towards obtaining FDA approval and making our device available to patients in the US. Other members of the series C round include Abiomed, The Accelerator Fund, Allos Ventures, Birchmere Ventures, Blue Tree Ventures, and Riverfront Ventures. 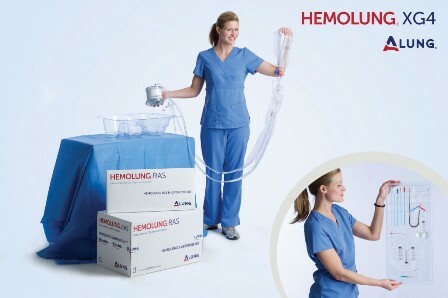 Image: ALung will use the funding for a planned US-based pivotal trial of Hemolung respiratory assist system. Photo: courtesy of ALung Technologies, Inc.